TVs were a little jealous of smartphones, so it’s natural that you’re now able to enjoy Smart TVs. So just what is a Smart TV? Of course you can still watch your favorite programs on these televisions as you normally would, but these devices add a plus – they allow you to stream content via your broadband connection from some of the most popular video streaming services such as Netflix and Hulu. You can even browse the Internet and check your social networking sites on some of them and even play pre-installed games. Need help? Check out these FAQs. Should I Get a Smart TV? Only you know what you want, so before you decide to take the plunge in purchasing a Smart TV, make sure you know what features you’d like most. 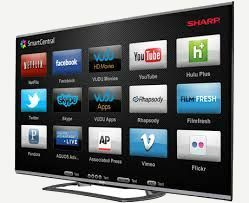 You can consult with online resources such as Smart TV Reviews buying guide or go to your nearest Smart TV retailer such as Best Buy to speak with sales associates that can help. Use these steps to get your Smart TV connected to your broadband connection.